Meet Milk. She`s a selfish, smarty pants superhero with no real superpowers. Not quite your A-list superhero, but that won`t stop the idiotic President (of Everything) from hiring her to solve the world's problems. Includes previously unseen bonus footage. A call from the President puts Milk on the hunt for a counterfeit. With the assistance of Tetsuko, Hanage, Dr. Eyepatch and Robodog, learn that the counterfeit has a particular love for Belgian Waffles. To catch him, Milk and Tetsuko open a waffle stand. The President accidentally deploys a missile after having a dream. He calls Milk for help, but keeps getting interrupted and sidetracked by her. Dr. Eyepatch determines that the errant missile will randomly select a target to destroy. Can the President get Milk to focus and intercept the missile before it hits? Episode 3: Don’t Give Up, Sumi High Baseball Team! Milk is tasked to save the fish after a cargo ship sinks, and its entire shipment of wine is spilt. With the loan of a submarine from Dr. Eyepatch and a mandate from the President, Milk sets out to keep the fish on the straight and narrow. What does an alien abduction and the classic conundrum of the dropped cell phone have to do with each other? Milk finds out after the President has been snatched by pointy-headed extra-terrestrials bent on harvesting a new food supply through cloning. After finding Tetsuko’s rice cakes lacking in elasticity, Milk aquires a rice cake making machine. The President calls with a mission involving a bird, a baby and a big bag of rice. When the cardboard shanty houses of the homeless are destroyed by fire, the President dispatches Milk to construct new homes. Love happens at the most inopportune time for two pigs in the pork factory. Luck is on their side when work place negligence and sexual harassment allows them to escape. Milk is called in to bring back the bacon. Milk may be in trouble when she learns that the omelet she just ate for breakfast was made with a missing T-Rex egg! Luckily the President’s missing cat provides the needed distraction for Milk and Tetsuko to clear the table of evidence. A case of stolen luggage from elderly people gives Milk a new mission from the President. Dr. Eyepatch gives her a new tool: an old man robot that runs solely on ramen. An afternoon visit to a ramen shop to charge up the new robot allows Milk to both open & close the case. After Tetsuko winds up in the shop after coming down with the Y2K virus, Milk is given Dr. Eyepatches latest creation: Bear Slaying Robo Willy. 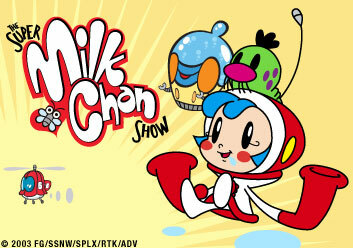 Milk is tasked with saving the world from an out of control Japanese black bear named Leonardo. Dr. Eyepatch hosts a retrospective of all of the characters’ bloopers. The world is put in danger by a special mushroom device. The Magic Shitake 1 creates a local disturbance in space and time, and it’s up to Milk to set things straight!